Liz Chamblee was nice enough to send me the 24-26" Rose Gold Cube Chain along with the Large Rose Gold Twist Living Locket Base and the Large Rose Gold Twist Locket Face with Swarovski Crystals. She also sent along 7 charms to go inside! 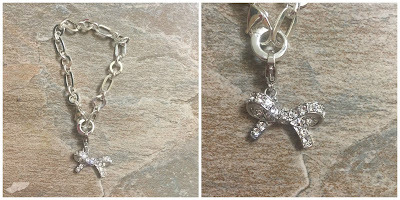 I had also purchased the 7" Silver Dangle Bracelet Chain as well as the Silver Crystal Bow Dangle! LOTS of new goodies to build my collection! They arrive in little take out boxes! SO cute!! The little pouch had my bracelet and dangle in it, the box had my living locket. The charms inside are SO perfectly me! Mom in the rose gold because I'm a mom and it coordinates, 3 birthstones for my kids (and I'm also May, Emerald), blog because, well, DUH. Knitting needles because I love to knit and lastly an anchor. My children and husband are my anchor to life, they are my everything and anchors have such meaning to me! I'm in love with my new jewelry! The pieces are just absolutely perfect and help tell my story. The Pave Bow Dangle is beautiful and looks like diamonds and looks really rich. I love that the locket is customizeable and I can change out the charms as often as I wish. Each season/holiday they release new items, so I can easily change it out for the occasion and with most charms at just $5, it's pretty inexpensive to get new ones and change it out per season/holiday. They also have watches that are customizable, as well as earrings, lanyards and leather band bracelets. Price: The chain that I received is $14, Locket Base is $16, The crystal topper was $20 and most charms are $5. My bracelet chain was $18 and the Dangle was $16. I think the Silver Heirloom Cross Dangle with Swarovski Crystals is lovely. I did not know they had earrings. I love the SILVER CUSHION CUT DROP EARRINGS! 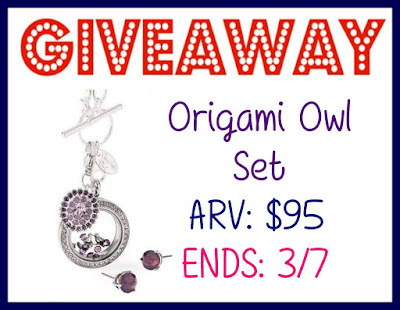 So pretty and a lot of great prices at Origami Owl. I love the Dangles. My favorite piece is the SILVER VIRGIN MARY DANGLE. 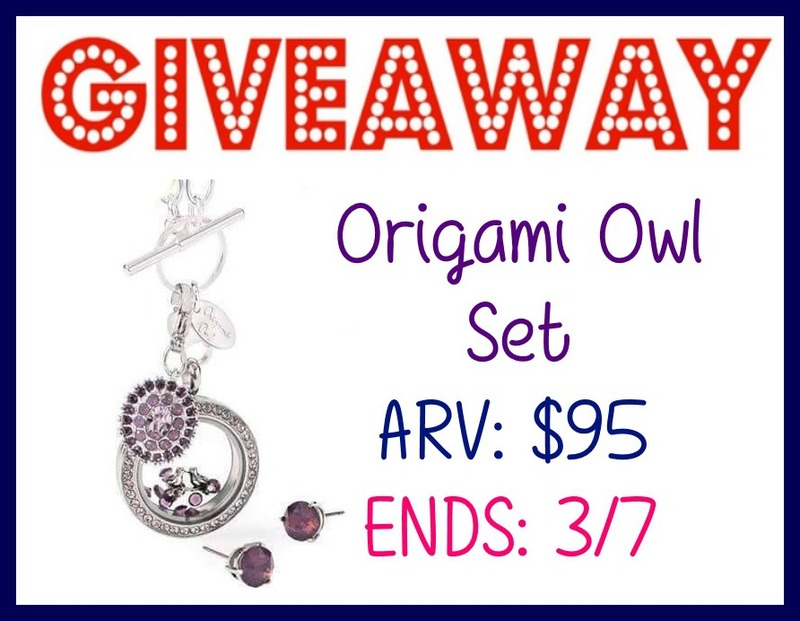 I like the Origami Owl set the best with some wedding charms on it for my daughters wedding coming up. She loves owls. This would be perfect to go with her wedding dress. I'd start with the LARGE GOLD TWIST LIVING LOCKET FACE WITH PAVÉ SWAROVSKI CRYSTALS. My favorite is the SILVER ETERNITY LANYARD WITH SWAROVSKI CRYSTALS with the cross and heart charm, silver faith charm, the SILVER ICHTHYS FISH CHARM and the 26.2 FULL MARATHON MEDAL CHARM. 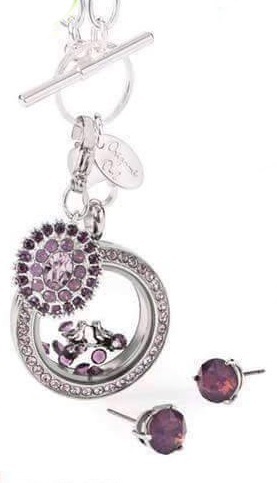 I like the Medium Black Twist Living Locket Face with Fuchsia Swarovski Crystals with the black base and the Large Silver Twist Living Locket Face with Tanzanite Swarovski Crystals with the Inscriptions® Large Silver Solid Twist Living Locket Base! I like the Rose Gold Genuine Leather Triple Wrap Bracelet. I like the INSCRIPTIONS® MEDIUM SILVER ROUND PLATE. I would have it say To Heaven and Back. Thank you! I love the MEDIUM ROSE GOLD LIVING LOCKET. I love these! My daughters spirit animal is an owl, haha or so we decided. But I love the charm and I would probably save it for her as a gift for when she's a little bit older. I love the CORE collection!! I would build a piece in memory of my father!! I love the nesting hearts with swarovski elements. I love hearts! I would love to have the in Memory of charm and a few of the birthstone charms. I like the "THE SOPHIA" ROSE GOLD STUD EARRINGS WITH PAVÉ SWAROVSKI CRYSTALS. I love the LARGE PRISM TWIST LIVING LOCKET FACE and the crystal charms! Thanks for the awesome giveaway! 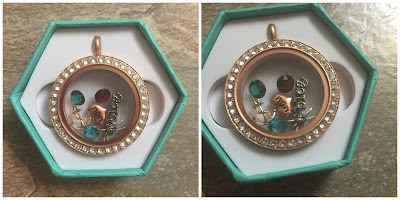 LARGE SILVER TWIST LIVING LOCKET BASE + FACE WITH LIGHT TURQUOISE SWAROVSKI, with lots of sparkly charms to go inside!! Pretty much anything is fine just so long as I can put the Dark Moss Green Stardust Swarovski Crystals in it! I like the LARGE PRISM TWIST LIVING LOCKET FACE. MEDIUM SILVER TWIST LIVING LOCKET BASE + FACE WITH MULTI-COLORED SWAROVSKI CRYSTALS with some spring charms because it is my favorite time of the year. My favorite would be the LARGE SILVER HEART LIVING LOCKET WITH SWAROVSKI CRYSTALS. I would put charms in it that remind me of my children. I love the SILVER DOUBLE ANGEL WINGS CHARM. I love the nail polish charm. Anyone who knows me would tell you it's perfect for me. I really like the Medium Silver Twist Living Locket Face with Multi Colored Swarovski. The different colors looks so nice. I think it will set the tone for the charms inside. I love the "Stop and Smell the Roses" Rose Gold Dangle. My favorite piece is the Silver Sea Turtle Charm. I love so many of them but I narrowed it down to the Large Silver Twist Living Locket Base and Filling it would be so much fun! I love the Glittered Easter Egg Charm! It's so cute! I like the Large Silver Heart Living Locket with Swarovski Crystals.